If you’ve never heard of this term, it means using theater as a way to empower a community, listen to its concerns and encourage change. It can be anything from kids role playing bullying scenarios in a school to patients in an addiction treatment center participating in a theater workshop. It’s interactive theater that encourages audience participation as a way to work through issues, cope and solve problems. Playback Theatre is an original form of improvisational theatre in which audience or group members tell stories from their lives and watch them enacted on the spot. Playback Theatre is used in over 50 countries in schools, organizations, treatment centers, conferences and more to bring group concerns to the surface and stimulate dialogue among participants. 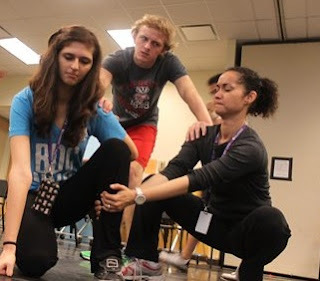 The Patel Conservatory at the Straz Center will host a Playback Theatre core training workshop in June, taught by Playback Theatre Practitioner Jen Kristel of Burlington, Ver. The goal is to bring a Playback Theatre chapter to Tampa Bay. The intensive four-day workshop will teach participants the basics of Playback Theatre and how it works. Students will have the opportunity to practice being both the actors and the audience members. All participants will tell and enact stories together in the spirit of fun and fellowship. The course is designed for all actors, mental health professionals and students, education professionals and anyone interested in theater for social change. Participants learn performance and improvisational skills, and keen listening and social skills. Playback Theatre requires depth, sensitivity and the ability to react to and give back to the audience. The workshop will be Fri., Jun. 7 through Mon., Jun. 10 from 9 a.m. to 5 p.m.
Housing options are available for those outside the Tampa Bay area.